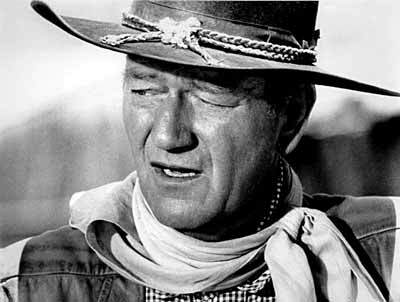 Below are John Wayne quotes and sound clips from some of his best known movies. The movie quotes are sound clips in wav format. Lower on this same page, below the movie quotes / sound clips, you can find some quotes from John Wayne the man, the inscription that is on his tombstone, and a brief biography. You might also like: John Wayne Cardboard Cut Outs. Below: John Wayne in a publicity photo from the movie "The Comancheros." All sound files found here retain their original copyright and belong to their rightful copyright owners. "True Grit" (1969). Starring John Wayne, Glen Campbell, and Kim Darby. Directed by Henry Hathaway. "McLintock" (1963). Starring John Wayne, Maureen O'Hara, Patrick Wayne, and Stefanie Powers. Directed by Andrew V. McLaglen. "Somebody oughta belt you in the mouth. "Big Jake" (1971). Starring John Wayne, Richard Boone, Patrick Wayne, Christopher Mitchum, Bruce Cabot, and Maureen O'Hara. Directed by George Sherman. "Chisum" (1970). Starring John Wayne, Ben Johnson, Forrest Tucker, and Glenn Corbett. Directed by Andrew V. McLaglen. "The Cowboys" (1972). Starring John Wayne, Roscoe Lee Brown, and Bruce Dern. Directed by Mark Rydell. "The Shootist" (1976). Starring John Wayne, Lauren Bacall, Ron Howard, James Stewart, and Richard Boone. Directed by Don Siegel. "The Man Who Shot Liberty Valance" (1962). Starring John Wayne, James Stewart, Vera Miles, and Lee Marvin. Directed by John Ford. Reportedly, this quote was an acting tip from John Wayne to fellow actor Michael Caine. "All battles are fought by scared men who’d rather be some place else." "Life is hard. It’s even harder if you’re stupid." "Life is tough. It's even tougher if you're stupid." "I’m responsible only for what I say, not what you understand." "I am a demonstrative man, a baby picker-upper, a hugger and a kisser. That’s my nature." "A man deserves a second chance, but keep an eye on him." "If everything isn’t black and white, I say, 'Why the hell not?'" "Tomorrow is the most important thing in life. Comes into us at midnight very clean. It's perfect when it arrives and it puts itself in our hands. It hopes we've learnt something from yesterday." John Wayne (born Marion Morrison, May 26, 1907 – June 11, 1979) is such an iconic American legend that his name has become synonymous with courage, integrity, heroism, America, and standing up for what is right. Born in Winterset, Iowa in 1907, he moved to California at an early age with his family. After graduating high school he attended the University of Southern California on an athletic scholarship, playing football until a surfing injury caused his retirement from athletics and subsequently lost him his scholarship. However, while still attending college he had begun working at local film studios, where he was able to begin picking up bit parts in various movies. John Wayne's movie career moved forward slowly for several years. He made more than 70 movies, including a long list of low-budget Westerns, before being cast as the Ringo Kid in the 1939 Western "Stagecoach." It was his breakout role. While his career had its ups and downs from that point until his last film ("The Shootist" in 1976), his triumphs far exceeded the low spots. While starring in and excelling at numerous roles, John Wayne became best known as the quintessential movie cowboy and war hero, and one of the best recognized symbols of America at home and abroad.